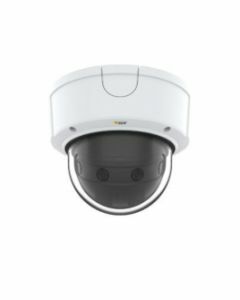 AXIS P3807-PVE acts as a single camera in your video management software (VMS), allowing you to combine four images into one and apply analytics across the entire image. You also save time on installation, need less cabling and pay for only a single license. In addition AXIS P3807-PVE gives you a wide variety of mounting options – recessed, flush, pendant or even back-to-back. It has four pre-set, adjustable positions for fast and easy mounting on walls, ceiling or in a corridor. And it comes with a weathershield for protection against snow and rain and to prevent reflections.